I am in a group at University that is producing a mobile application targeted at Android. Our efforts are going to be on the mobile platform and making an application that 'stands out'. It is very basic and so the scale is probably not right. The top bar is the action bar and system bars (time etc). Once the image is chosen, it starts searching for images that match the chosen image. One suggestion that was made was to have the buttons bouncing around the screen (not "too fast"). I don't think this is a very good idea (yet they think it is a brilliant idea). Another suggestion was to have the user drag the image to an icon of a server to upload it. I think this may work. It was also mentioned that standard stuff was boring so it should not be used. I disagree completely. I still think good graphics would improve the app, and maybe a bit more animation, however, the standard navigation elements are best. So are the suggestions good ones, or are they going to hinder the use of the application? Is the key to creating standout applications implementing crazy ideas? "We want to be different" is a very common request but is lacking any real context or purpose much of the time. Ask them which apps they use with bouncing icons that they find a joy to use. My guess is zero. They'll then respond with 'well, we want to be different' where you can hopefully point out that there is 'good' different and then there is 'pointless' different. The bouncing icons being the latter. Firstly, bouncing interface elements make a simple choice really hard to do. It's not fun to try to click a button then have it move, it's more like Lucy whisking away Charlie Brown's football. Secondly, how will people using the d-pad or a trackball catch these moving targets? A drag'n'drop has the same problems: can't be done with the d-pad, takes longer than tap-to-select, tap-to-upload. The interface isn't the fun part of an app, the end result is. Check the user-interface guidelines listed here - none of them encourage moving interface elements. There's nothing more valuable than a user's time - why would you make any task harder for the user, or take longer to complete? There are many, many terrible Android apps in the marketplace already. If you want to stand out from the crowd, make something that lets users acheive their goal (choosing a fun picture) as quickly and easily as possible. Crazy ideas are in fact the key to creating outstanding applications and interactions. However, we need to distinguish between "good craziness" and "bad craziness". The former leads to such innovations as iPhone, Sifteo, Oblong, and Sphero. The latter leads to things that sound cool but are impractical, like Geode that complicates a fairly simple process (consumer use). How does this interaction add value to the user? How does this improve their experience in the process? When a crazy idea is good, its positive impact will be obvious with few reservations or doubts. That being said, the nature of the design process is in iterations. It's not foretold that a bad crazy idea won't evolve into something great. An impractical idea by one person can inspire another person to create something much better. Thus, you shouldn't banish or punish people for bad suggestions unless they do that to derail the process deliberately. Instead, you should encourage other team members critique crazy ideas from the position of value to the user. You should also ask the authors of those unusual suggestions to prototype & test their ideas on their own because things look & sound much differently in one's hand than they turn out in reality. As for your particular problem with bouncing, take a look at the earlier question "Blinking, bouncing and flashing elements". They sometimes lead to wonderful, new, innovative solutions. The second of these occurs if the crazy solutions are applied to specific problems. If there are identified issues, then applying craziness can be a really positive way forward. However "we should do things different" is not a problem that needs solving. It may be that "our users are bored with the normal", which can be expanded into a nice question, with crazy solutions as options. There is a lot that can be gained from a research perspective into this sort of design decision: Find a clear question; see what is already out there; then find a solution or development. The problem is not that wobbling buttons are a bad idea. The problem is that "we want to do somethign different" is a poor motivation. You have to know what the design rules are before you know which ones to break. So personally, I would advocate designing the app by following the Android UI guidelines and pattern library first -- if you don't have a good knowledge of those, you're probably never going to write a great Android app anyway. If the design, when usability tested (as early as possible -- on paper is fine), turns out to be "boring" or "unusable", then you can think about which guidelines and patterns to break to suit your intended audience, because then you'll really be in a great position to make the most informed decisions about why you need to do something different. Drag to share: worth a try. Yes, but only if you believe in them, and are ready to remove them if they happen to not work out. Innovation includes trial and error. They say standard stuff is boring. I say standard stuff is great stuff. Buttons should not bounce. Common controls like navigation elements and buttons has kind of a behavioural contract. The basic expectations on common controls should be met. Buttons are expected to stand still. The more standards you use, the easier it will be to add on new ideas. In an environment that feels solid and where users can rely on controls doing what they are expected to do, there is more room for experimental ideas, than if all standards would been thrown out the window. You write that it is a university assignment. I guess that there will not be many users suffering from potential bad design choices. This might actually be one of your best opportunities in life to spin crazy ideas without insulting neither users or designers, and this way practising just how crazy you can make an app. Maybe bouncing buttons is not the idea you want to spend time on, but it can be made more interesting, for example "How can we get the bouncy effect without pulling Charlie's football?" or "How can we [insert crazy idea here] without hindering the use of the application? ", and so on. "You're trying to click to upload, but the button moves, so it's hard." That's about as much of a feature as a broken wheel on a shopping cart. I didn't come here to test my pushing ability. For your photo app, adding moustaches or a muscular body or something silly could be fun. You could also make a game where you challenge people to click on something that moves. The important thing is not to confound the user's intentions. If I'm trying to upload a photo, let it be as easy as possible. If I'm trying to test my clicking skills, bring on the difficult targets. Experiment. Implement the bouncing buttons and make them use the app. Who knows, it might work... more realistically, they'll see for themselves how annoying it is! Why not default with the camera on and ready to take a picture? Think barcode reader app, you don't have to tell it to do something, it opens scanning for a barcode. Crazyness just for the sake of crazyness or being different is just plain old crazy. Period. Any of the crazy and different ideas that have ever succeeded have always had inner purpose and reason for doing stuff differently and have always managed to because they make sense in their context. Having the buttons bounce around the screen would probably annoy most users so much that they wouldn't want to use the application. Sure, the feature might be a bit "crazy" and perhaps "out of the ordinary", but the goal of an application is to let the user achieve some sort of a goal instead of fighting with the interface to get things done. Considering that there might be elderly users or users with not-so-good coordination using the application, having the buttons bounce around would probably turn them off. 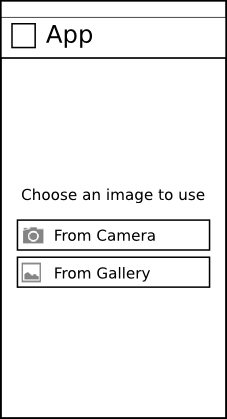 Dragging an image to an icon to upload the image is a good idea. It is also being implemented in HTML5 as drag and drop. Having a graphical interface where the buttons move around could be good for one thing and one thing only, if you're developing a breathalyser test without the "breathalyser" part.. And seeing your mockup, it would suggest that this is the task. There's one thing to "think crazy" and another thing to "think outside the box crazy". Letting the buttons move around in a GUI is the former. Transferring the mobile network service technician tool, the cell phone text message, into a consumer product, the SMS, is the latter. It's very hard (read impossible) normally to distinguish if a new idea will be a hit or miss, as with the text message as a consumer service, because it has never been done before. However, letting buttons move around the interface, for no other reason than "it would make a crazy impression" may not been done before, as far as I know. But the reason is not that no one has ever thought about it, the reason is more because it is simply a bad idea to begin with. Here it's easy, with the text message it wasn't. Letting the buttons move around is nothing revolutionary. It's like developing a cell phone that's too big to fit in your pocket for the sole reason to make it too big to fit in your pocket. It's crazy, but that's it. No hidden agenda, the idea begins and ends with what it is. How to describe integer and floating point entry fields? Which of the two is the best UI approach for a tablet app destined for reading? Visualize next step in learning application? Can you give your top factual reason (not opinion) why you chose not to use Material Design for your UI components?